There were 8 new pets datamined from the latest Alpha patch. It's still a mystery how we'll obtain them. Two of the new pets will come from professions — Trigger (Engineering) and Wyrmy Tunkins (Archaeology) (both pictured below). We're excited to learn more about these new pets, as well as many of the previously datamined ones! There were two notable updates to Dalaran in the recent Alpha patch. We previously covered how collectors would catch the elusive Dust Bunny in Legion. However, the spawning mechanic of this wild pet was changed. 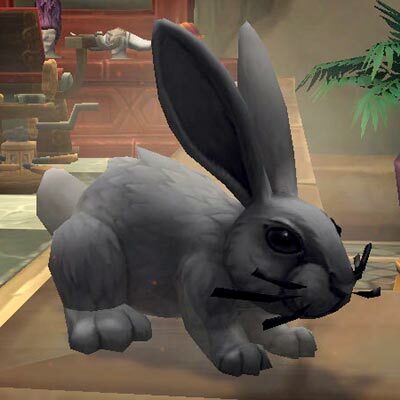 Instead of a single spawn within Dalaran's barbershop, players now receive a 5 minute buff when clicking the rug that previously spawned the bunny. Note: The rug will still despawn when it is activated, and will take roughly 10-15 minutes for it to respawn. The buff from the rug, Spring Cleaning, grants the player the ability to see wild Dust Bunnies in Dalaran. The wild pet is not visible otherwise. Players will usually find a few Dust Bunnies throughout Dalaran. Who knew the entire city was so dusty? Good thing pet collectors will be around to help clean up! Dalaran received another update to what we previously reported as the Pet Battle Tournament Island. 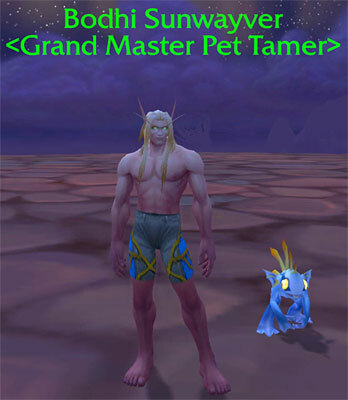 Sir Galveston, Bodhi Sunwayver (pictured right), and Tiffany Nelson — all three are Grand Master Pet Tamers, however only one can be interacted with. Approaching Bodhi Sunwayver will trigger a World Quest, Fight Night: Bodhi Sunwayver, and you can battle his team for a small reward. He has three level 25 rare quality pets: Itchy, Salty Bird and Grommet. Currently this bonus objective can be completed multiple times on the same character, rewarding gold, player experience and pet experience each time. Developer Jeremy Feasel has confirmed on Twitter that the ability to complete the quest repeatedly in this manner is a bug and is not intended. Pet Battle quests are still very much in development and not quite ready for official release. Blizzard posted a discussion thread regarding some Pet Battles abilities that may see some updates in Legion. "We’re getting close to deploying some changes to pet battles that we’ll test in the Legion Alpha. We wanted to outline some of them here for you, so that you have a thread in which you can talk about this with us. As always, these are changes we’re testing, subject to further change, not final, etc." The proposed changes are for the following. A full list with explanations of tuning changes can be found in the discussion thread. CORGI PUP. I has all teh excitements!! Moar corgis! That archaeology pet looks cool too. Wonder if it's based on the Graves model - looks a bit like him. Just curious, but I was trying to find some links to view these guys in 3D, and my usual goto is Wowhead, but none of the 'view in 3D' buttons bring up a viewable pet, just a blank box. I checked to see if it was my browser, but looking at most anything else on wowhead works just fine. Could anyone with access to alpha and possibly youtube post the pet journal with a Legion pets walkthrough, so we could at least see the 3D from the journal? Or, does someone know if this has already been done? 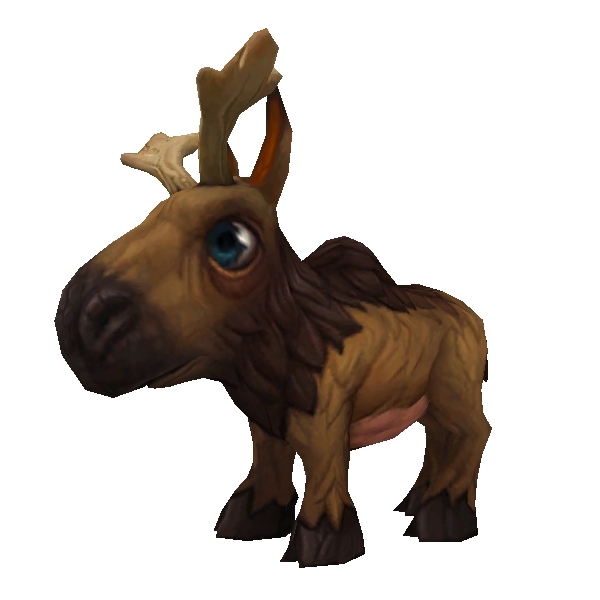 The baby elderhorn was discussed on wowhead a few days ago as being part of a world spawning pet battle with a wolf that is about to attack it and you can accept the quest and fight the wolf to save the calf. It would seem like aquiring the elderhorn through that mechanic would be logical, but who knows how it will actually turn out.